SHERBROOKE, Que. 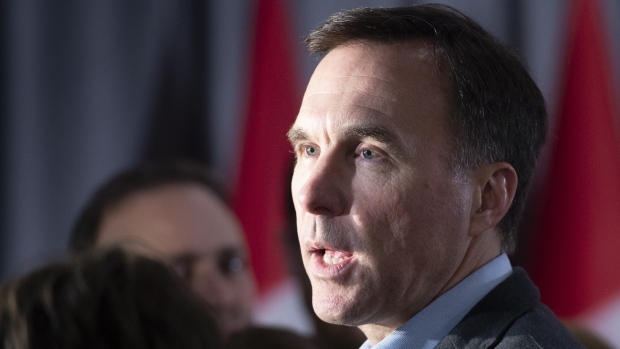 -- Finance Minister Bill Morneau painted a rosy picture of Canada's economic future Wednesday, despite diplomatic and political upheavals around the world that could disrupt global trade and impede growth just as this country prepares to head to the polls in October. Morneau's upbeat assessment came as he arrived for the start of a three-day cabinet retreat -- the first meeting of Prime Minister Justin Trudeau's cabinet since he conducted a small shuffle earlier this week. Canada, which has a free trade deal with the EU, will work to continue a "very strong trading relationship" with the U.K. when -- or if -- it exits the European Union, he added. Ministers got a briefing about some of the world trouble spots Wednesday evening from six of Canada's envoys, including Janice Charette, the high commissioner to the U.K.; John McCallum, ambassador to China, and David MacNaughton, ambassador to the U.S.
On Brexit, Charette said Canada wants to see a strong U.K., a strong E.U. "and a strong and constructive relationship between the two parties." Both sides will have to show "flexibility and patience" to reach an agreement for an orderly British exit from the E.U., she said. However, should the U.K. leave the European Union with no agreement, she said discussions have already begun with British authorities about how to achieve a "seamless transition" in which Canadian businesses continue to receive preferential access to the British market. While Brexit and China are the crises du jour that threaten economic stability, MacNaughton drew attention to an ongoing trade irritant with the United States: punishing tariffs on Canadian aluminum and steel which have remained in place despite Canada, the U.S. and Mexico reaching a deal on a new North American free trade deal. MacNaughton said he continues to remind American officials, legislators and business leaders at every opportunity that the tariffs are "illegal" and "unjustified" and that the Trump administration's justification for the tariffs on national security grounds is "absurd."